This section covers both the setup of the datalogger and also plotting/downloading data from the datalogger. 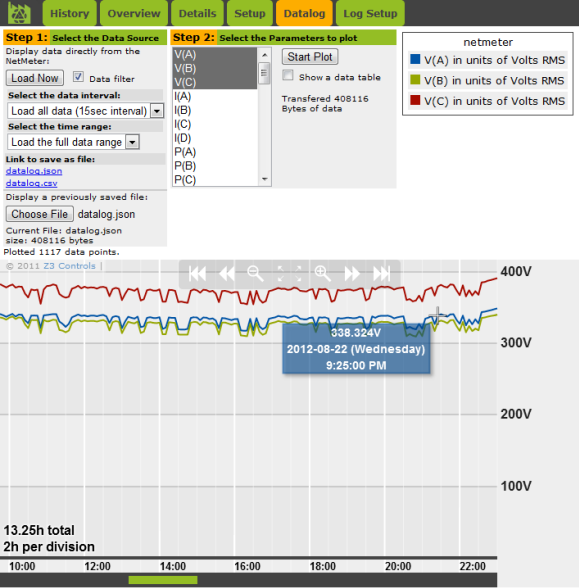 Energy/Power data storage: this is enabled by default when the NetMeter is first configured. 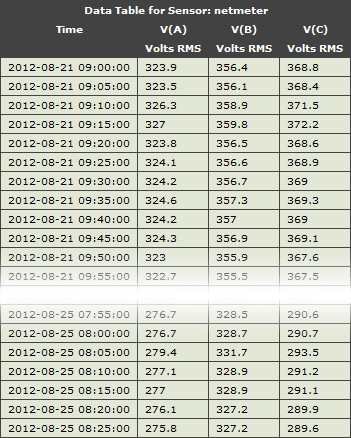 The total power demand in 1 minute intervals is stored in addition to hourly cumulative energy. 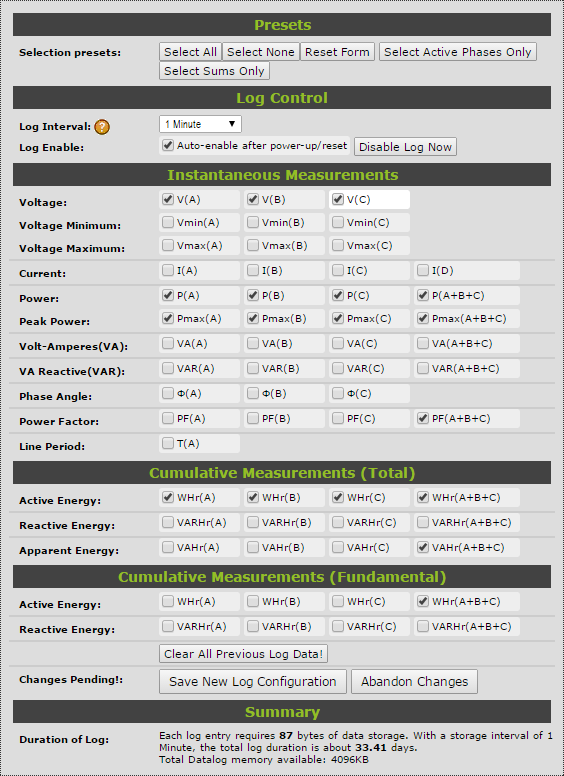 This section describes the Advanced Data Logger. The Advanced Datalogger uses non-volatile memory to store up to 53 electrical parameters at a user-defined sample interval. Datalogger memory is managed by the NetMeter as a FIFO (First-IN-First-Out) memory. Consequently, when the memory capacity has been reached, the oldest data will be discarded to make room for newer data. This creates a continuous, moving window into the the most recent values for the enabled parameters. Log Interval: the sample period that data is stored into memory. A shorter interval will use memory more quickly. Auto-enable after power-up/reset: make sure this is checked in order for the Datalogger to start logging after a power failure or reset. Enable Log Now will immediately cause the NetMeter to start logging data. The page will refresh after pressing this button so make sure that any other changes to the form have been saved by pressing the Save New Log Configuration button first. Otherwise, all changes will be lost. Make sure you press the Save New Log Configuration button before pressing the Enable Log Now button if changes have been made to the form. Voltage Minimum - Vmin(A), Vmin(B), Vmin(C): the minimum voltage of Phases A, B, and C during the sample interval. These values are useful in detecting flicker (see IEC 61000-4-15). IEEE paper on Flicker. Voltage Maximum - Vmax(A), Vmax(B), Vmax(C): the maximum voltage of Phases A, B, and C during the sample interval. Also useful for detecting flicker. Power Max - Pmax(A), Pmax(B), Pmax(C), Pmax(A+B+C): the maximum values of P(A), P(B), P(C), P(A+B+C) detected over the datalog interval. Since these are RMS values, the integration period is about 1 second. Consequently, brief (1s) peak power measurment will be captured. Phase Angle - Φ(A), Φ(B), Φ(C): By default, this if the phase angle between voltage and current (V/I)for each of the phases. However, the advanced sensor setup provides other options: voltage-to-voltage (V/V) angle and current-to-current (I/I) angle. Power Factor - PF(A), PF(B), PF(C), PF(A+B+C): the ratio of active power to apparent power expressed as a percentage for each phase or for all phases combined in the case of PF(A+B+C). All the information required to calculate power factor is available through P(x)/VA(x) so it may not be necessary to capture all 3 parameters if memory capacity is a concern. Line Period - T(A): The period (in microseconds) of the Phase A voltage. Inverting this value gives the frequency of the Phase A voltage. Cumulative Measurements (Total): cumulative measurements are the ongoing summation of Active/Reactive/Apparent power and result in a Watt-Hour energy value. The "total" cumulative values are the summation of all frequency components up to 4KHz and include both the fundamental and harmonic energy. Active Energy - WHr(A), WHr(B), WHr(C), WHr(A+B+C): the cumulative version of P(A), P(B), P(C), P(A+B+C) in units of Watt-Hours. Reactive Energy - VARHr(A) VARHr(B) VARHr(C) VARHr(A+B+C): the cumulative version of VAR(A), VAR(B), VAR(C), VAR(A+B+C) in units of Watt-Hours. Apparent Energy - VAHr(A), VAHr(B), VAHr(C), VAHr(A+B+C): the cumulative version of VA(A), VA(B), VA(C), VA(A+B+C) in units of Volat-Amp-Hours. Active Energy - WHr(A) WHr(B) WHr(C) WHr(A+B+C): the component of the Total active energy that is contained at the fundamental frequency. The harmonic distortion is the difference between the Total and Fundamental. Reactive Energy - VARHr(A) VARHr(B) VARHr(C) VARHr(A+B+C): the component of the Total reactive energy that is contained at the fundamental frequency. Make sure you press the Save New Log Configuration button if changes have been made to the form. Otherwise, changes will be lost when you navigate away from the form. What data should be enabled for logging? Log total WHr(A) WHr(B) WHr(C) to track the differences in power between each phase. For example: when the NetMeter is used with 3 separate single phase loads. Log Vmin(x), Vmax(x), PF(x), and both the Total and Fundamental versions of WHr(x), VARHr(x) in order to study power quality. The sample interval will affect the total duration of the data record. While a shorter interval allows more temporal detail to be captured, it is not necessarily an advantage. Even when long sample intervals are chosen, the capture of very brief voltage dips or surges can be accomplished using the Vmin/Vmax data. The cumulative data is summed 8000 times per second. The result, when plotted, represents an average over the interval. Consequently, it may not be necessary to use short sample intervals to acquire the necessary information. The advantage of using WHr/VAHr/VARHr is that fluctuations in power that occur between samples will be accounted for in the data. Power/VA/VAR are sampled at the instant of the sample time. As a result, fluctuations that occur in between samples will be invisible. If P15 is not available as a display option, then you will need to upgrade your firmware. The P15(A+B+C) is automatically derived from WHr(A+B+C) and is available for plotting in both the interactive datalog plotting utility and the datalog plotting widget. However, you must have more than 30 min. of data stored in the data logger in order for P15 to display. Some of the features listed in the description below may be missing from older firmware releases. Consider updating your firmware if this is the case. The first step to plotting data from the Datalog is to load the data. Alternately, the data may be saved to a file in either CSV format (for Excel) or JSON format (to be able to plot it later using the Z3 tool). 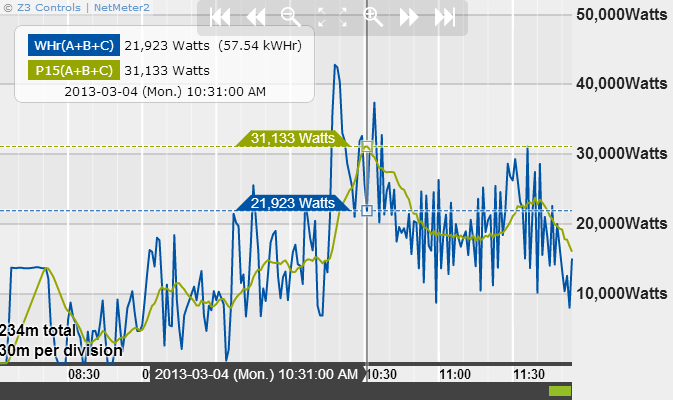 The first filter option allows a subset of interval data to be loaded. For example: 1 out of every 4 samples. The second option allows a shorter range of data to be loaded. For example: today so far. 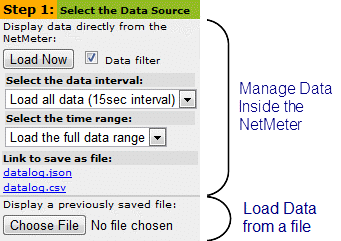 To interactively plot the data inside the NetMeter, select the desired Interval and Range and press the Load Now button. Right click on datalog.json and "Save As" a file to your hard drive. The datalog.json type file can be used later for the "Display a previously saved file" option. Right click on datalog.csv and "Save As" a file to your hard drive. The datalog.csv type file can be used for spreadsheet programs such as Excel. What file format should I choose to save the data? Choose the JSON format (datalog.json) to be able to view your file using the interactive plotter functionality built into the NetMeter or available through the online datalog plotting utility. Choose the CSV (comma separated values) format (datalog.csv) to be able to use the data with Microsoft Excel. For the greatest flexibility, save both formats! The line after "rdptr" contains the parameter names starting with "time"
The time units used by the NetMeter are the number of seconds since "ybase" (0:00 of January 1, 2010). In Excel, the serial number 1 represents 1/1/1900 12:00:00 a.m. Times are stored as decimal numbers between .0 and .99999, where .0 is 00:00:00 and .99999 is 23:59:59. Since firmware V1 Build:0673, the above formula may be applied by the NetMeter so that no conversion is required inside Excel. This is accomplished by setting the "s" (scale) parameter in the query. This is done automaticaly when using the supplied link shown above. Make sure you have installed firmware V1 Build:0673 or higher for this feature to work. Use the "Choose File" button to select and load a previously saved file. The file must have been saved previously using the JSON format. 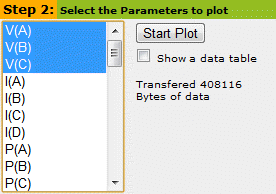 If you need to plot data from a NetMeter that has been saved to a file, and you are not able to connect to a NetMeter, the Online datalog plotting utility can be used for this purpose. The file must be saved using the JSON format. The list of available data items for display is shown in a list widget. Select a parameter to plot by clicking on it, or select multiple parameters to plot by holding the "Ctrl" or "Shift" keys on your keyboard while you click with the mouse. The plot may be interactively zoomed by clicking and dragging on it, or by using the zoom/pan icons at the top of the graph area. The "Show a data table" checkbox option will cause a data table to be displayed below the chart. Take care enabling the data table when large data sets are loaded: it may result in lengthy time delays in your browser. It may also cause your browser to run out of memory. When first loading the data, use the filter option to reduce the amount of data.